Just thought I would revisit a post I made way make on June 8th ,2012. 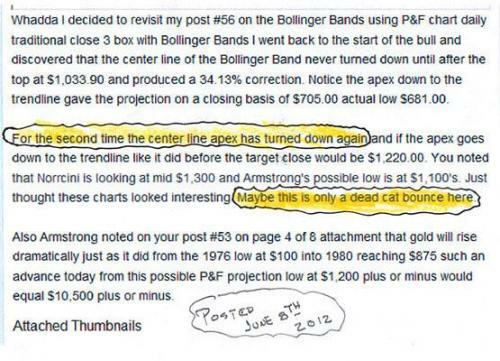 As I said in that post maybe this is only a dead cat bounce here. As it turned out it was. 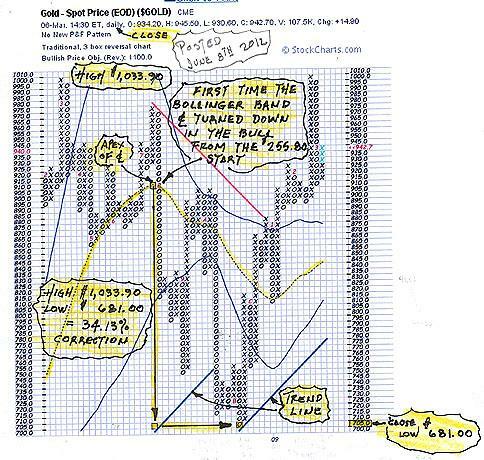 At the time I mentioned this we were actually going back up to retest the 1800 resistance area but, I noticed that the apex center line of the Bollinger Ban had turned down like it had once before from the beginning of the Gold Bull Market which netted a large 34.13% correction off the 1033.90 cycle top and sure enough it couldn't hold and came back down and broke the major 1523 support area and stopped one box lower than I had shown at the 1220 box on a closing basis with the final low coming in at 1179.40 for another large 38.69% correction this time. So if the apex center line turns down in the future I will certainly take notice. Just thought I would share this observation. 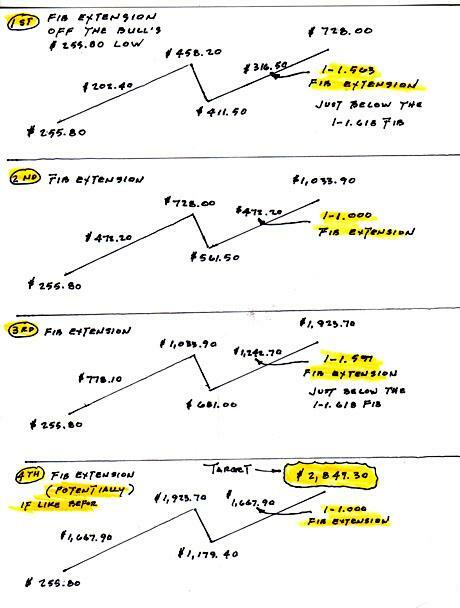 1-2 Fib extension that took place in the final parabolic move up in the 70's Gold Bull. If we ever break the 1923.70 top I will post in detail what I mean. 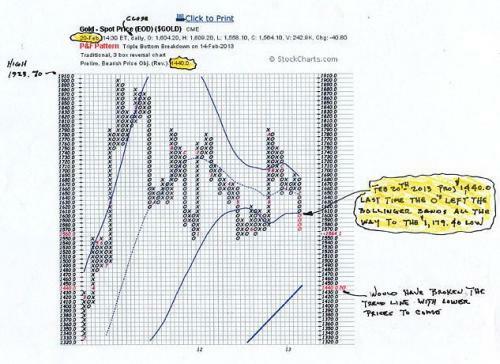 Who knows Neal Wave says the Gold Bull is already over. Just for fun, I thought I would see if I could figure out how to get the final low off this closing P&F chart that I have shown before on post #62 above. 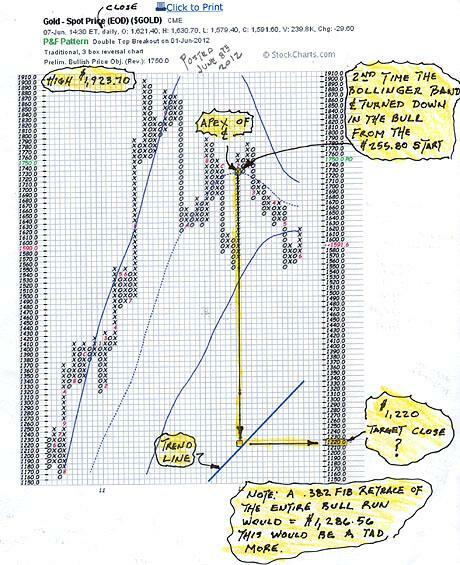 So I went back in time to February 20, 2013 on the P&F chart and noticed that 1440.0 was the last price projection that was given before it sank all the way to the final low of 1179.40 and also noticed on the chart that it was the last day that the 0's column left the bottom of the Bollinger Bands. #2 So lets use the center of that box which would be 1435.0 for this exercise. #3 Now from this 1435.0 center of the box we substract the low at the beginning of the bull market which was 255.80 and we get 1179.20 the final low came in at 1179.40 20 cents higher. Is this a coincidence or what? 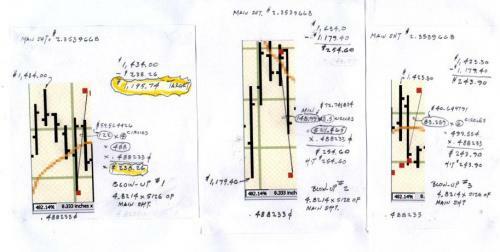 Golds previous swing high is 1434.00 and according to my work gold is only going to make it back up this time to the 1407.00 level as shown on the Point and Figure chart as I am posting this gold is trading around 1315.00 on October 21. We will see if it turns out. I saw an article today on the 321 Gold Site called "Double Bottom Reversal" by Ron Rosen, November 21, 2013. So I decided to try and figure what the Double Bottom Price might be. Here is what I came up with using the 6 Month Daily Chart from Big Charts with indicator Parabolic SAR. My target price is $1,195.74. My last post stunk hope this one works out better. 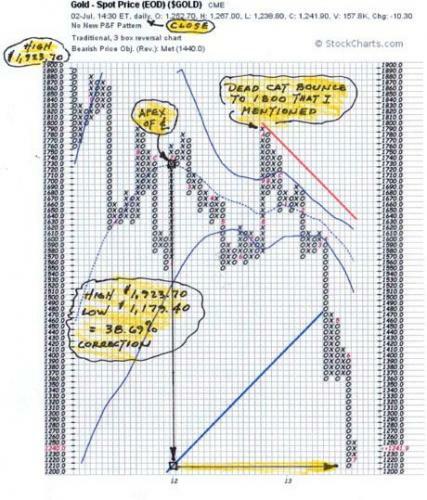 See charts below. 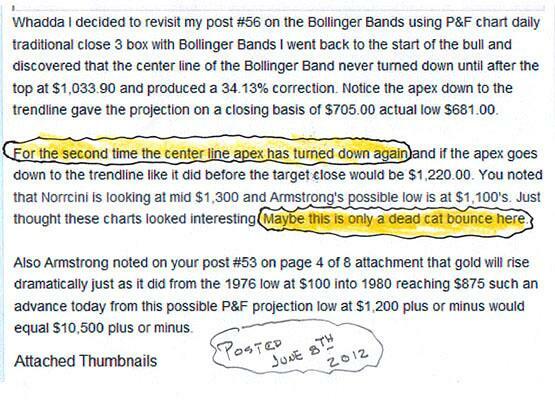 So as to the article on the 321 Gold Site by Ron Rosen November 21st 2013 for him to be correct it appears today would be the day. I certainly hope so. That would make for a nice New Years Celebration. 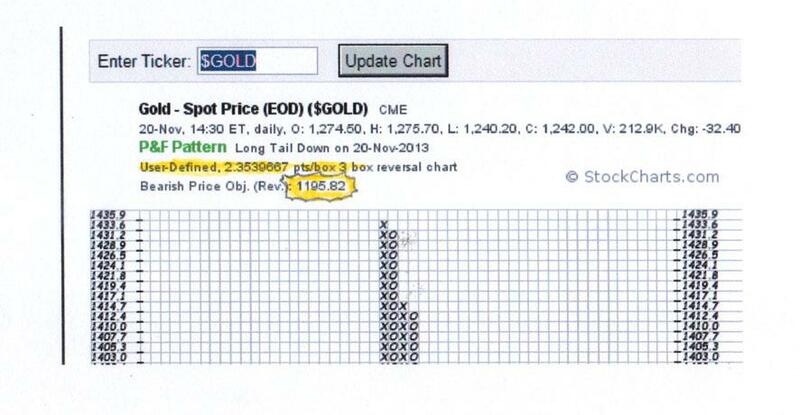 Just read an article on the 321 Gold Site today February 11, 2014 called Gold $ 2800 Fiction or Fact by Stewart Thomson. 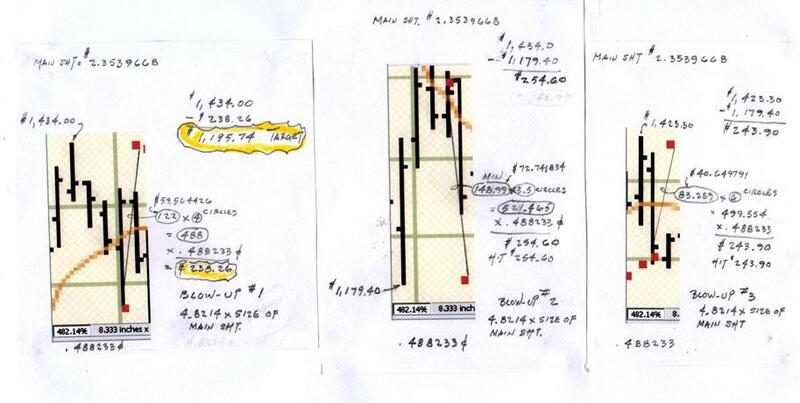 On his note #16 he says that there is a potentially enormous head and shoulders bull continuation pattern forming on the monthly chart shown on note#13 the technical target is about $2800. Of course as you can see it has a long way to go to confirm it. I have worked up some interesting cycle fib extensions that might agree with his observations that have occured during our present bull market. As you can see after we extend out to an extreme 1-1.618 fib area cycle top the next cycle extension that follows is a smaller fib only a 1-1.000 extension for the next cycle top. If we do it again like we have done in the past the coming 1-1.000 fib extension would take us to a target price of $2,847.30 which would match up with the potential enormous head and shoulders bull continuation pattern formation on the monthly chart that Stewart Thomson was talking about. It would be great if it turns out. I'm surprised the thread from over a year ago is still running in my absence, but if you don't mind it's probably a good time to start fresh. Yes, there is a new thread. Let's begin again.